A three-metre long "pee bale" has been installed at Wimpole Hall. Head gardener Philip Whaites is urging his male colleagues to pee on the straw bale to activate the composting process on the estate's compost heap. He said the "pee bale" is only in use out of visitor hours, since "we don't want to scare the public". 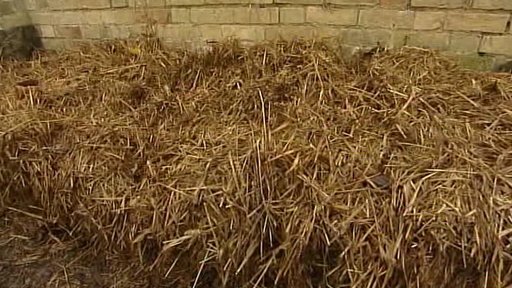 He said: "For eight weeks now, male members of our garden and estate teams have been using the outdoor straw bale when nature calls. "The pee bale is excellent matter to add to our compost heap to stimulate the composting process; and with over 400 acres of gardens and parkland to utilise compost, we need all the help we can get. "There are obvious logistical benefits to limiting it to male members of the team, but also male pee is preferable to women's, as the male stuff is apparently less acidic." Rosemary Hooper, Wimpole estate's in-house master composter, said: "Most people can compost in some way in their own gardens. "Peeing on a compost heap activates the composting process, helps to produce a ready supply of lovely organic matter to add back to the garden. "Adding a little pee just helps get it all going; it's totally safe and a bit of fun too."